You might have heard that Han Solo’s leather jacket sold at auction for $191,000, while J.K. Rowling’s writing chair went for a whopping $394,000. But you might not know what exactly goes on at the likes of Sotheby's and Christie's, what with all the paddle waving and the torrential verbiage that pours from auctioneers’ mouths. Before you try your hand at some bidding, check out these 15 fast-talking auctioneering terms. American auctioneers are perhaps best identified by their rapid-fire speech, known as the auction chant, as well as bid calling, crying bid, and cattle rattle, specifically for livestock auctions. According to Texas Monthly, the chant comes in three parts: the statement (“I’m bid ten dollars”), the suggestion (“Ten dollars, twenty dollars”), and the question (“Do I hear 30?”). So why do auctioneers talk like this? To “hypnotize the bidders,” according to Slate, and to lull them into a “conditioned pattern of call and response.” As for the speed, that's to convey urgency. Filler words are basically all the words besides the bid. They differ by auctioneer and give their chants their unique rhythm and roll. They also give potential buyers a few seconds to think about their next bid and to remind them of what the last bid was. The auctioneer isn’t the only one working the house. The bid catcher, also known as the ringman, takes note of every bid and communicates them to the auctioneer either with hand signals or verbally. A lot refers to an item or group of items that's going up for sale. When an item goes up for auction, it’s said to go on the block. The block refers to the auctioneer’s podium, which in the past was a literal block of wood. The three Ds stand for debt, divorce, and death, often one of the reasons an item or items goes on the block. Linguist Barry Popik says sometimes it’s the five Ds, death, disease, divorce, drugs, and denial. If you watch the Antiques Roadshow, you’ll know that the provenance of an object can increase its value. A borrowing from French, provenance refers to the history of ownership of an item, back to when it was first created, if possible. One money means a single bid for an entire lot, or several items at once. So $100 for five paintings would get you all five paintings for that hundred smackers. On the other hand, times the money basically means “each.” In other words, if an auctioneer says a lot of five paintings is “times the money” and you bid $20, you’re bidding $20 per painting. An auction is dubbed a white glove sale when every single lot sells. This rare occurrence is so-called because of an old tradition in which the auctioneer was bestowed with a pair of white gloves. If bidding is feeling lackluster, an auctioneer might employ the chandelier bid—that is, a fake bid in which he or she points at the ceiling or wherever an imaginary bidder might be. Also known as the rafter bid, such a practice is technically not illegal, but it is frowned upon. Peter Funk is a historical term for a fraudulent bidder who works to raise prices and cheat buyers. The name comes from a character in an 1834 novel, The Perils of Pearl Street: Including a Taste of the Dangers of Wall Street, by Asa Greene. 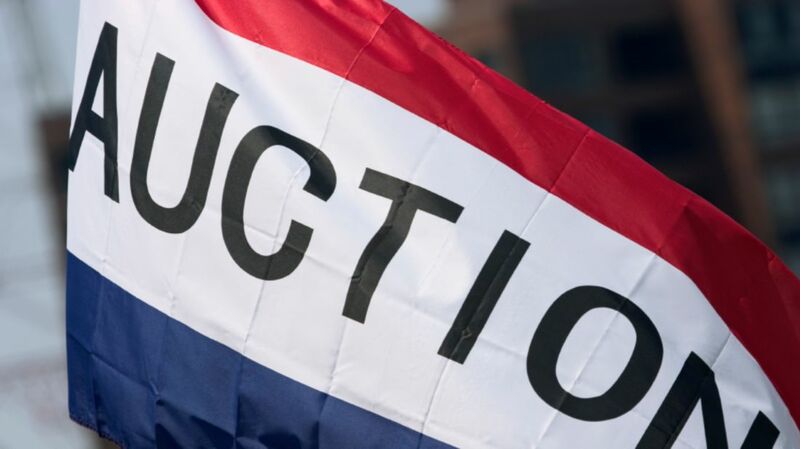 While in traditional auctions the price of an item is raised by bidders, in a Dutch auction, the price of an item or property is gradually lowered until someone finally agrees to buy it. In the world of IPOs, a Dutch auction works similarly. All potential investors end up paying the same price per share, which is the lowest price that was bid. So if you bid $100 per share, and the lowest bid ends up being $75, you only have to pay $75 per share. What makes this type of auction Dutch? It’s not clear but we’re guessing the origin is similar to that of idioms like go Dutch, a general sort of derisiveness against the Dutch because of a rivalry between the Dutch and the English in the 17th century. An old British tradition, candle auctions allow bidding to go on only as long as a short candle burns. The highest bid at the time of the candle burning out is the one that's taken. The hammer price is the final, successful bid, officially sealed with a bang of the auctioneer’s gavel or hammer. Additional sources: Artspace magazine; Investopedia; Sotheby's; Weese Auction Co.: Glossary of Auction Terms.